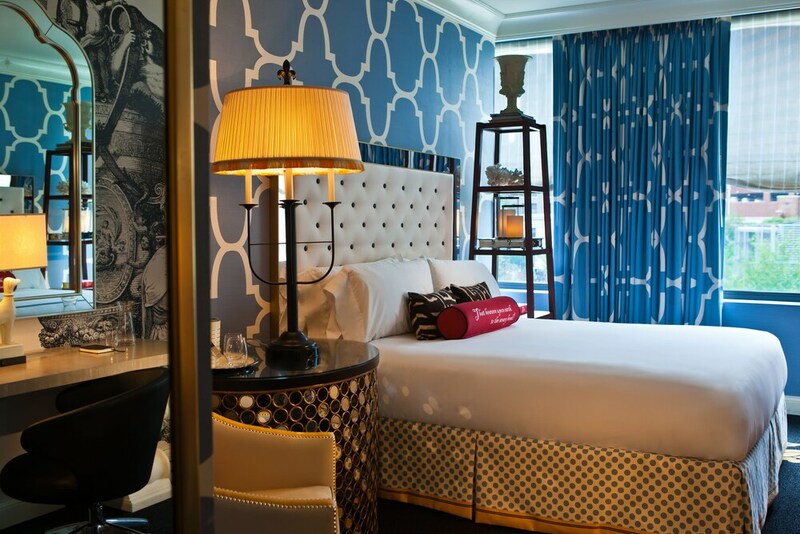 A stay at Kimpton Hotel Monaco Philadelphia places you in the heart of Philadelphia, steps from Independence Hall and Liberty Bell Center. This 4.5-star hotel is 0.7 mi (1.1 km) from Penn's Landing and 0.1 mi (0.2 km) from Independence National Historical Park. Make yourself at home in one of the 268 air-conditioned rooms featuring iPod docking stations and minibars. Your bed comes with down comforters and Frette Italian sheets. 42-inch LCD televisions with cable programming provide entertainment, while wireless Internet access (surcharge) keeps you connected. Private bathrooms have designer toiletries and hair dryers. Enjoy recreation amenities such as a 24-hour fitness center or take in the view from a rooftop terrace. Additional amenities at this hotel include wireless Internet access (surcharge), concierge services, and wedding services. Enjoy American cuisine at Red Owl Tavern, a restaurant which features a bar, or stay in and take advantage of the 24-hour room service. Mingle with other guests at the complimentary reception, held daily. Relax with a refreshing drink at one of the 2 bars/lounges. Full breakfasts are served on weekdays from 7 AM to 11 AM and on weekends from 8 AM to 1 PM for a fee. Featured amenities include a 24-hour business center, express check-out, and complimentary newspapers in the lobby. Planning an event in Philadelphia? This hotel has facilities measuring 13000 square feet (1208 square meters), including conference space. Kimpton Hotel Monaco Philadelphia features a 24-hour fitness center and complimentary bicycles. Dining options at the hotel include a restaurant and a snack bar/deli. Guests can unwind with a drink at one of the hotel's 2 bars/lounges. Each day guests can enjoy a complimentary manager's reception. A computer station is located on site and wireless Internet access is available for a surcharge. A 24-hour business center is on site at this 4.5-star property. Event facilities measuring 13000 square feet (1208 square meters) include conference space. This luxury hotel also offers a rooftop terrace, tour/ticket assistance, and multilingual staff. Onsite parking is available (surcharge). Kimpton Hotel Monaco Philadelphia is a smoke-free property. Red Owl Tavern - This restaurant specializes in American cuisine and serves breakfast, lunch, and dinner. Guests can enjoy drinks at the bar. Stratus Rooftop Bar - This rooftop bar specializes in American cuisine. Guests can enjoy alfresco dining (weather permitting). Happy hour is offered.